Mandarin Animal Hospital believes that when you travel for pleasure or business, you shouldn’t have to worry if your pets are in safe hands. Your neighbor or the teenager down the street may be kindhearted and responsible, but they often lack experience or an in-depth understanding of your pet’s health needs and idiosyncratic nature. This is why we offer your pet a safe, welcoming home away from home at our hospital’s pet boarding facility. The team at Mandarin Animal Hospital's pet boarding facility have many years of experience in providing the most high-quality care for cats and dogs, so whether you're out of town for a day or a week, you can rest assured that your special companion is in the absolute best hands. Our staff is also happy to administer any necessary medications to your pet during their stay with us, and we can offer routine checks with members of our veterinary medical staff. We feed our guests Hill’s Science Diet, but also allow owners to supply their pet’s food from home with specific feeding instructions. We also allow our clients to bring a special toy or personal item from home so their pet is more comfortable during their stay. We ask you to make a reservation, especially prior to holidays, and require all pets be free of internal and external parasites and to be up-to-date with their vaccinations. For dogs this includes Rabies, DA2PP, and Bordetella. Cats must have Rabies and FVRCP. Additionally, for a modest fee we can provide your dog with a bath and brush-out on the day you are coming to pick him or her up. Please ask for more details about our available grooming services. For those who are seeking accommodations for their cats, we have a separate area for felines so they can have a quiet place to nap and enjoy their stay with us. Our Dog Daycare: A Fun-Filled Day! We are happy to provide daycare services to the special dog in your family while you're away for the day. 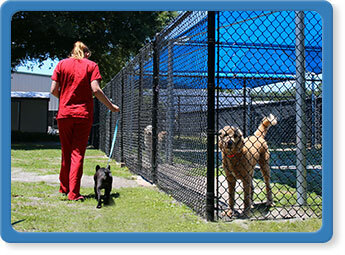 During their stay at Mandarin Animal Hospital's boarding facility, your dog will be cared for by members of our highly experienced, well-trained kennel staff. Your dog will be treated to exercise throughout the day, including outdoor playtime in shaded areas. Once they've had their fill of the outdoors, your dog will be given plenty of time to relax in our comfortable, climate-controlled facility. When you return, you can expect to greet a happy - and tired! - companion, which will be excited to come home again. Please call us for our pet boarding rates. If a boarding animal requires medications we charge $5 per day for administration.